0.8mm thick. A strong pull suitable for all figures. All products (except plain material) are adhesive-backed for ease of use, and can be cut with scissors, craft knife, or a small guillotine. Magnetic Discs, Adhesive-backed (cut from lightweight magnetic sheet) 25mm, Pack of 15 .. Magnetic Discs, Adhesive-backed 30mm, Pack of 12 .. Magnetic Discs, Adhesive-backed 15mm, Pack of 25 .. Magnetic Discs, Adhesive-backed 20mm, Pack of 20 .. Magnetic Tape, Adhesive-backed 0.8mm Thick, 10 mm Wide .. Magnetic Tape, Adhesive-backed 0.8mm Thick, 12.5mm Wide .. Magnetic Tape, Adhesive-backed 0.8mm Thick, 15mm Wide .. Magnetic Tape, Adhesive-backed 0.8mm Thick, 20mm Wide .. 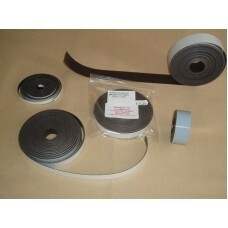 Magnetic Tape, Adhesive-backed 0.8mm Thick, 25mm Wide .. Magnetic Tape, Adhesive-backed 0.8mm Thick, 30mm Wide .. Magnetic Tape, Adhesive-backed 0.8mm Thick, 8mm Wide .. Magnetic Tiles, Adhesive-backed 0.8mm Thick 150mm Square, Pack of 5 ..